I so wish I had a bunch of photos on this page of my past German Shepherd Dogs (GSD or GSDs) 1980's. I had beautiful dogs. Tamar was Black and Silver and Tabitha and Timothy were Coal Black. They were all the Original or Old Style GSD Dogs, more straight backed than what is in the Conformational Show Rings today. Sadly I lost all of the photos I had of my dogs to black mold in N WI. My first three dogs were, as my next three will be, Working Dogs. Tamar and Tabitha had several Working Dog Titles. All of my GSDs were trained to pull and pack and did tricks and all had other jobs, like fetching the News Paper and such. I had my first three GSDs in the mid to late 1980's early 1990's. Then for a while I had other breeds of dogs. 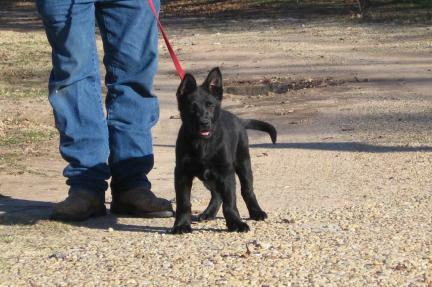 Now, we are ready to own GSDs again and looking forward to sharing their adventures and training photos on this site. I did not enter the World of GSDs fast or easily the first time and I have not this second time. I rebought all of the GSD books that were also lost I owned that were also lost because of the black mold in WI. I have looked at photos, reread the books, searched my heart, and started searching for the right dogs and the right breeders. I have found a few nice, reputable Breeders and one lead me to another. It is such a wonderful thing when God works it all out and things start falling into place. I hope that not only have I found GSD Breeders, but also friends to chat about GSDs with in the Breeders I have purchased dogs from. PLEASE SCROLL DOWN TO SEE PHOTOS AND BIOS OF OUR GSD ~ PAST AND PRESENT. 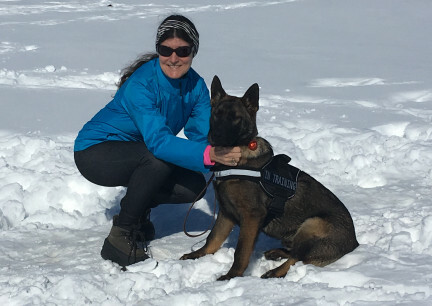 I looked LONG and HARD to find the type of body style that is correct for a Working Dog and the closest to the Original German Shepherd Dog Standard for the Breed. Amazingly, and Shamefully, the body style of the GSD was ruined in the Conformational Show Ring. Judges started "putting up" dogs with far too much angulation and roach backs, so Show Breeders start breeding for that. 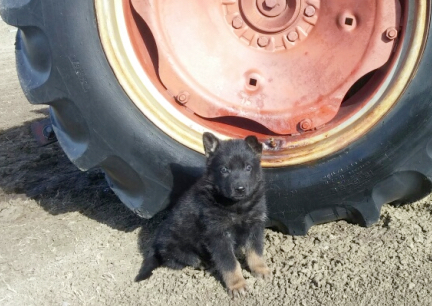 GSD were bred as WORKING DOGS. Working Dogs need a good bone and build and need to be correct as the ORIGINAL STANDARD FOR THE BREED CALLS FOR. In 2017 when I started looking for our next male/sire, I was appalled to find how many of the lines now have long hair bred in. How many so called 'good breeders' are breeding FOR long hair. 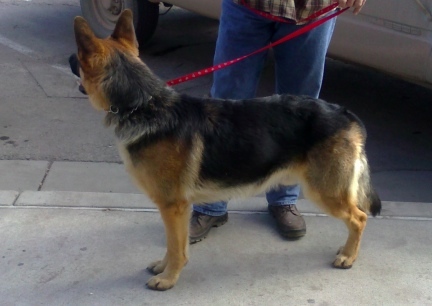 Long Hair is a disqualification within the GSD Standard for the Breed. WHY BUY FROM WORKING LINES? People who actually Work With and Train their dogs for Jobs, BREED the best they are able to. They breed dogs with correct body styles, they breed to The Standard For The Breed, and they Breed for Long Life Health. 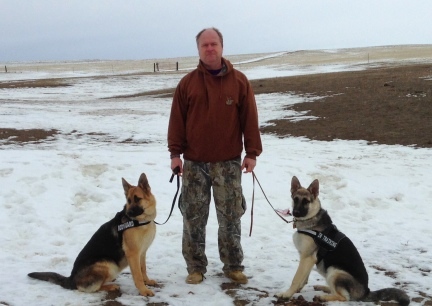 As I was pursuing the idea of getting back into GSD and having that three or four dog team again, I was in a Gun Store in Rapid City, SD. 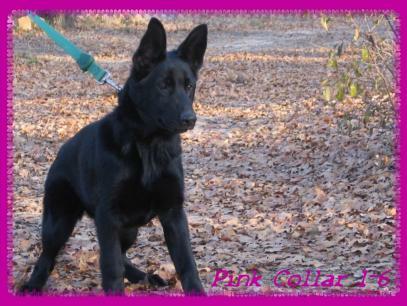 I glanced out the window and saw this beautiful GSD dog in the photos here. He was sitting in the front seat of a truck and I could see his profile and rich colors. I quickly found Deron and had him come and see....I told him "THIS! is what I am looking for." Deron told me to ask around, that the owner was probably in the store. I did. I found the gentleman that owns the dog. He took us out to meet Sam. 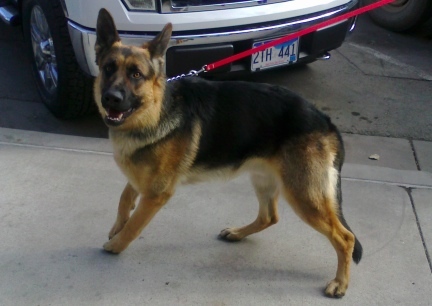 Sam was, as I remember 16 months old, and had the temperament that every GSD owners prays for. What a nice dog all around. The owner called his wife and got the Breeders number for me. He also told us that Sam came from, and the Breeder "has a website and everything". 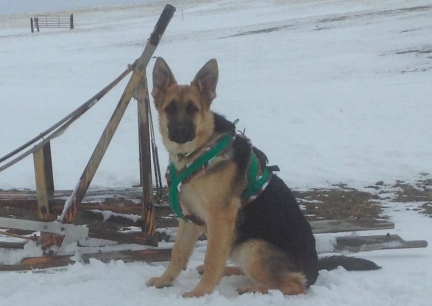 He also told us that Sam is doing well in Schutzhund Training in Deadwood, SD. Sadly, I lost that piece of paper he had given me with the Breeder's information on it. But from everything I remembered he said, I have a dog from that kennel. I believe it to be Titus' Breeder. But it could have been Tekoa's Breeder. <smiles> I would sure like to run into Sam's Owner again. I have contacted the Deadwood Schutzhund Trainer and Deron and I are hoping to go and watch one day they have the dogs our working. Hopefully, I will run into Sam and His Owner there. ALWAYS ADDING TO THEIR PAGES HERE ON THIS SITE! Each of our dogs have their own pages here on this site, with photos and stories, but I also wanted to have an overview of the dogs here on this page too. PLEASE NOTE: Please note that we have photos of our own dogs all over this website, almost every single page. 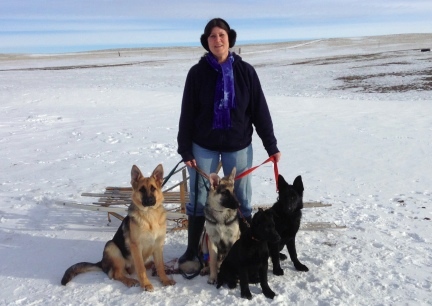 I also have a Training Journal, with photos, of our GSD on the Sled Dog page, see Navigation at right, scroll to the bottom of that page. Have a look, we LOVE showing them off. EACH OF OUR DOGS HAS THEIR OWN PAGE HERE ON THIS WEBSITE. YOU CAN SEE MORE PHOTOS AND READ MORE ABOUT EACH OF THEM THERE. Why Titus? I had decided in late 2011 that it was time to start making decisions about another large dog. I wanted to start working a dog to pull and pack again. I also need a dog that can step into our older Farm Dog's place when she is too old to handle it any longer, and I wanted her to help train the pup. (you can see a page on Raya, our English Shepherd, on www.faroutliving.com ) Deron and I live way out and having a good Guard Dog could be very important, and you never know when that could be. I narrowed the search down to GSDs. The breed I had stared with when I started thinking about our next dogs from the beginning. And as I have said on so many of the pages here, the search first begins for the Right Breeder! Because we live so far out, I had to rely on the Internet...and that can get "sticky". However, I have/had bought five equine that way. 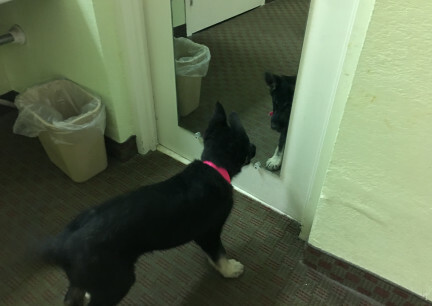 I had to come to the Conclusion that it was the Internet or no GSD, or not the one I really wanted to own, the one with the right look and pedigree. Titus' line, and full pedigree, can be followed back to the 1800's with many German Titled Dogs, both Show Ring and Schutzhund through a dog named Ace Vonder Haus Wolfsquelle, to name one of the many. I am so glad we kept a couple of puppies out of Titus, not only are those puts really turning out into nice, well bruit dogs, Titus is no longer with us. A close relative talked me out of Titus. Titus was only used 3 times for breeding and proved to be quite the Sire! While he is sadly missed, he is off showing off his tricks and keeping people safe in their daily lives. I searched the Internet for my GSDs; I had to. No one around here has them for sale. But the more I looked out of SD the more I like the two breeders I found on the other side of the State. So when new photos came up of a litter I had been looking for, I had to call and ask for a couple more full body shots of two of the little females. I chose Female #1, but only after hours of looking at those photos over and over and over. Deron told me to call and Reserve the Puppy we named Tekoa. The name Tekoa <ta-KOE-ah> is from the Holy Bible. Amos 1:1 "Amos was a Shepherd from Tekoa." I loved the name back in the 1980's and I love it now. It just seems to be the perfect name for a nice looking, Old Style/Classic Style GSD. After all, we all assume that Amos, way back then, had a Shepherd Dog with him helping him with his flock. Back in the late 1980's when I decided on GSDs, I liked the idea of each of them having an unusual name starting with the letter T from the Holy Bible. We are Christians and read our Bibles. We did not just do a search for Biblical Names starting with T's. These are names or words we have read in Bible History. Tekoa is a large GSD with big bones and a loving and gentle heart. She sleeps in our bed with us and goes everywhere we do. She is smart and lovely and always works to please us. We are so pleased with her. Everywhere we take her, people just comment on how beautiful she is. Sadly, she is now 'gone'. She is missed terribly! 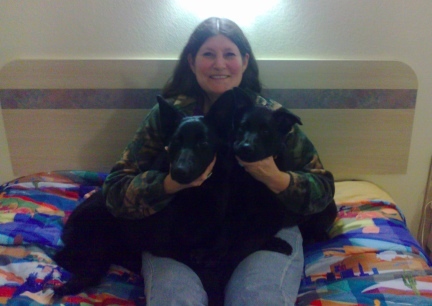 After I found Titus and Tekoa and I am sure because it took so long to find the first two, Deron told me to continue to look on line, all over the Nation, for my Black GSD. He said to find the one I really liked, one I really wanted to own. Well, I kept looking and came across a very nice website with nice photos and pedigrees right there and easy to use. THIS is what I had been looking for. I spent a lot of time on that website, and went back often. After about a week or praying and thinking about it, I contacted the Breeder. She was very helpful and kind. We sent MANY emails back and fourth and she send several more photos for me to look at. Without asking, she sent shots of the puppies from all sides. The Breeder sent several photos. The little girl in PINK stuck out in my mind. I really liked the look of this dog. And I assured my friends it was not because she was in my color. She had the conformation I was looking for as well as being coal, or totally black. I really loved the look on her face. She just seemed, from the photo, to be an "honest" dog. What is an Honest Dog? One you can read. One that shows you what it is thinking. Not one that you have to worry about when training, it is going to give it's all. Texas Tea, the name we gave this pup, moves like a dream. Yes. I am convinced that if you set a full glass of water on her back, she would not spill it as she moved along in the "flying trot" that GSD are known for. Needless to say, Texas Tea has lovely conformation and her temperament.....ahhhh! JUST what I was looking for. Very loving dog. To Boot. She has a VERY IMPRESSIVE PEDIGREE with Working Dogs throughout. Police, Military, an Aunt on the MI Police Force and a Nephew that is a Certified, Bonifed, Service Dog. When I saw this photo, of this puppy, I honestly broke a smile with teeth. When we saw Titus' photo when he was five weeks old we coined a saying "HI! I am Titus and I am full of Spit and Vinegar." The same was true when we saw this first photo of Turquoise. Turquoise is a very good puppy. She is fun and smart, busy and loving. She is a puppy that even when running around and acting nutty, you can pick up and hold and she settles down right away and enjoys your company and all the cuddling. She learns very quickly and is very pretty. Be sure to note that not only is Turquoise out of Working Dogs, she has Police, Military, Border Guard Dogs, Service Dogs in her Pedigree. She has an Aunt that is serving on the MI Police Force. She also has a son that is a CERTIFIED, BONIFED, SERVICE DOGS. We bred Titus and Turquoise, after they were 3 y/o, so that we could keep a puppy from this breeding for a Farm Dog. Because Tychicus is taking over the job from a dearly loved and missed, full time farm dog, named Raya, we gave him the middle name Ray to honor her. He has turned out to be 'quite the dog', and he has a Very Nice Pedigree. 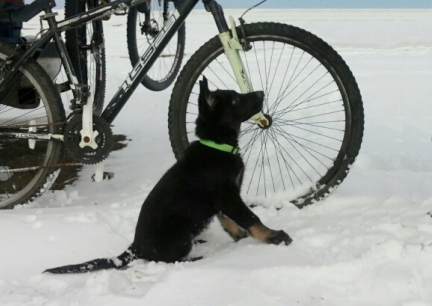 We bought this puppy from a Working Line/Schutzhund GSD Breeder in FL. This little girl dog, named 'Kazmaier's Tabaliah The Gatekeeper', will take over for Tekoa, who is also sadly missed. Tabaliah will be the dog that runs with me when I ride my bicycle, goes horseback riding with us, watches our backs and is with us all the time. Deron wanted to buy a dog with different blood lines than we had. Tabaliah is from WORKING LINES with Very Impressive Pedigrees! Teanna is from our own breeding. Her parents are Titus and Texas Tea. I was not going to keep a puppy from this litter. I was not. But the more I looked at this nice girl and thought about it....well, let's just say, I am so glad we kept her. Teanna has her mother's build and great disposition! She has her daddy's charm and playfulness. When Deron and I look at Teanna, we can both see, each of her parents, with her own self coming through...as they say, 'in Aces!'. Our next, or up and coming, Stud Dog. And Boy, did I search for the RIGHT Dog with the RIGHT, make that a CORRECT Pedigree and Genes. I did not know how much I liked the Sable Color on a GSD til this boy arrived! He Is Flashy and Man, is He Smart! ** These dogs are no longer living at our Kennel. The contents of this page for About Our GSDs is still under construction. Please check back later!